Cutter Loose remains on a mooring at Dinner Key Marina as we make final preparations for our departure to the Bahamas. Weather is the critical factor in selecting a date for this passage. We are patiently waiting for the approach of high pressure, bringing light winds from the south. Preferably, there will be no cold fronts expected for several days after our departure. At this time of year, it can sometimes take weeks for an acceptable weather window to arrive. Several Island Packet buddy boats have congregated here in Coconut Grove with similar ambitions. Our collective plan is to transit the Gulf Stream together, but only when weather conditions are right. Coconut Grove is an attractive staging area for a crossing to the Bahamas. 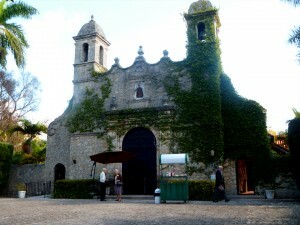 Excellent grocery stores, restaurants, churches, West Marine and Home Depot are within an easy walk from the harbor. 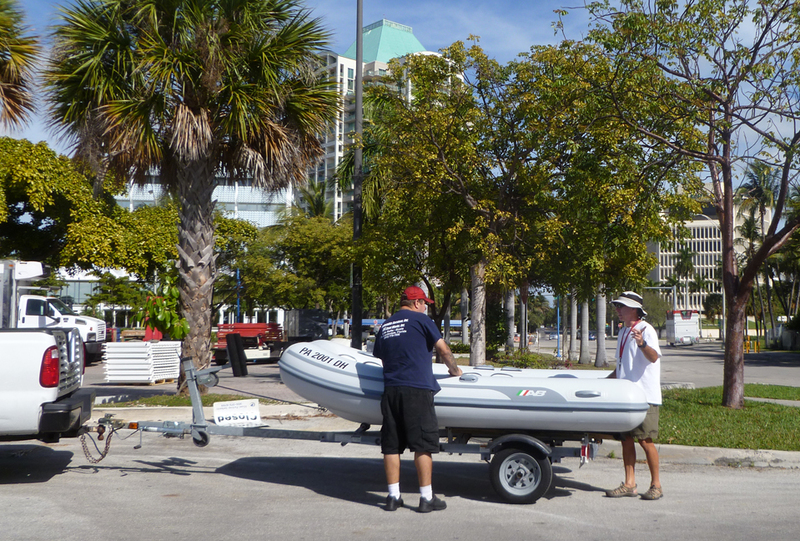 During settled weather, a Dinner Key Marina launch provides shuttle service to and from the dinghy dock. For ordering last minute supplies, overnight packages can be delivered to the marina office. Prices are higher and the supply of goods and services is less abundant in the Bahamas. Most cruising boats are fully loaded with fuel and provisions before casting off for Bahamian waters. Cutter Loose is no exception. 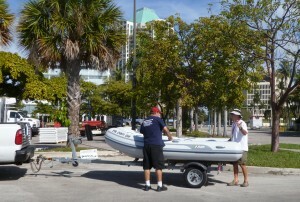 Our new dinghy is delivered to Dinner Key Marina on Tuesday, February 21st. This is an important event in the life of a liveaboard cruiser. A dinghy is to water as a vehicle is to land. It is used every day to transport crew and their stuff. This new AB 10 foot dinghy features larger tubes, an abundance of carrying space and a rigid bottom…qualities that improve stability and speed while keeping the crew dry. 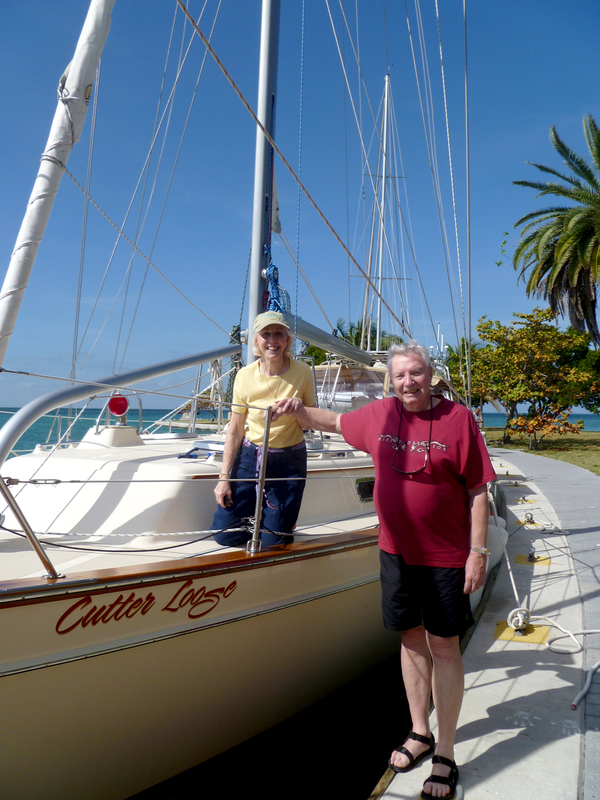 During our stay at Dinner Key, Cutter Loose is visited by sailing friends Chuck and Jeanne from Pittsburgh. I served as a crew member on Chuck and Jeanne’s Island Packet 40 Relationship on two separate bluewater voyages from the Chesapeake Bay. The first voyage was to Bermuda in June of 1995. Then in November of 1995, we sailed together from Hampton, VA to Tortola in the British Virgin Islands. In subsequent years, Pat and I enjoyed several weeks aboard Relationship during her time in the Caribbean. While we are away from home, Chuck is screening and storing our forwarded mail and helping to address correspondence-related issues. It is a joy to follow in the footsteps of Chuck and Jeanne and to share time together aboard Cutter Loose. During their stay, we enjoy daysails on Biscayne Bay and an overnight in Boca Chita harbor, followed by a provisioning trip to the local Costco in the comfort of a car. All systems are go for departure. The weather, however, is not cooperating. On Saturday and Sunday, the 25th and 26th, a moderate cold front passes over the Miami area bringing brisk winds from the north and east. Conditions are so windy on Sunday that shuttle services to and from the dinghy dock are suspended for the entire day. We spend this time aboard re-commissioning the ship’s watermaker, carefully stowing recently acquired provisions and studying the Bahamas charts and cruising guides. It never ceases to amaze us how time passes so quickly aboard Cutter Loose when focused on a list of boat chores. By Tuesday, winds have subsided to 12 knots as a dome of high pressure inches its way into the Miami area. Forecasted conditions for Thursday, March 1st appear near-perfect for our departure to the Bahamas. The level of excitement aboard Cutter Loose is elevated with the knowledge that in 48 hours, the next phase of our winter cruise will be underway.